SEOUL, Nov. 9 (Yonhap) — South Korean authorities have revoked driver’s licenses of visually impaired athletes who took part in the Asian Para Games, officials here said Friday, following their vision tests. 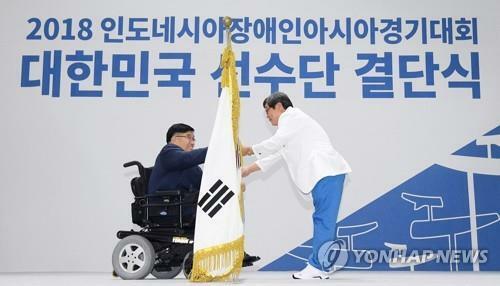 According to the sports ministry and the Korea Paralympic Committee (KPC), the blind athletes recently retook the aptitude test for driver’s licenses to check their actual eyesight after returning from the Asian Para Games in Indonesia. The test results showed their eyesight doesn’t meet the vision requirements, which forced the authorities to revoke their driver’s licenses. Controversy loomed after a lawmaker claimed that four visually impaired athletes selected for the para national team passed a vision test and obtained level 1 and level 2 driver’s licenses. The vision requirements for the level 1 license is binocular visual acuity of at least 0.8 and 0.5 for each eye. The vision requirement for the level 2 license is binocular visual acuity of at least 0.5. Three of the four athletes took gold medals at the Asian Para Games in Jakarta. Critics then suspected that these athletes may not have visual impairments because they had passed the vision test for driver’s licenses. But it turned out that there were no problems with their Asian Games participation because they were selected for the national team under International Blind Sports Federation (IBSF) classifications. Currently, blind athletes are given “classes” based on their visual impairments in accordance with the IBSF standards. In order to be classified, an athlete needs to submit medical reports approved by an ophthalmologist and needs be reviewed by a classification committee of the IBSF. The KPC announced that it will review its classification system for visually impaired athletes because there’s a big discrepancy between vision standards for driver’s licenses and sports classification standards for the visually impaired.